Ganjang gejang is a traditional dish that’s made by marinating fresh raw crabs in a mild soy-sauce based brine. 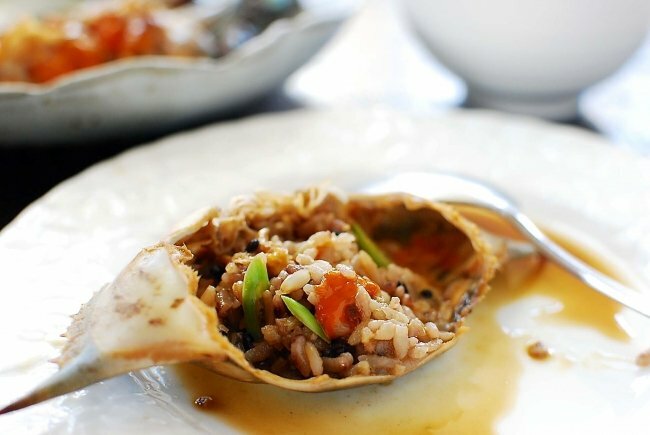 Your bowl of rice will be gone in no time as you enjoy sucking the flavor-packed crab meat out of the shell. 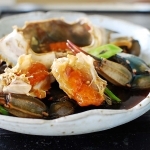 Gejang (게장) is a traditional dish that’s made by marinating raw crabs in soy sauce. 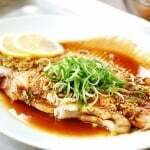 Historically, a very salty soy sauce brine was used as a way of preserving the crabs for a long time. 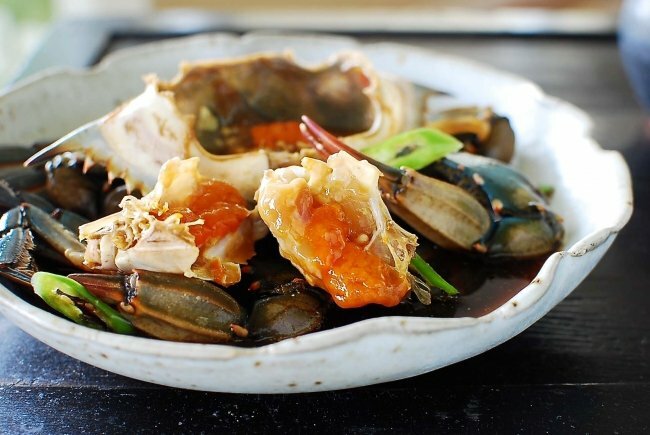 Nowadays, gejang is enjoyed for its deliciously savory taste, so fresh crabs are marinated in a mild soy sauce-based brine and usually eaten within a few days. This modern version is enormously popular in Korea. 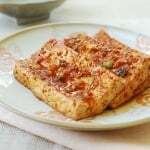 The soy sauce-based gejang is also called ganjang gejang (간장게장) to distinguish it from a spicy version, which is another modern concoction, called yangnyeom gejang ( 양념게장). In my family, two of us are big fans of gejang. When I was pregnant with my first child, gejang was what I craved the most. Interestingly, my first born loves gejang. During one visit to Korea, he waited 45 minutes in line outside on a hot summer day to eat at a restaurant well known for its gejang. I wonder if his love for gejang has anything to do with my pregnancy cravings. Gejang is eaten with a bowl of rice. Koreans even refer to this dish as a “rice thief” (밥도둑). Your bowl of rice will be gone in no time as you enjoy sucking the flavor-packed crab meat out of the shell. Be sure to leave a spoon or two of rice to mix with the roe and tomalley in the top shell. 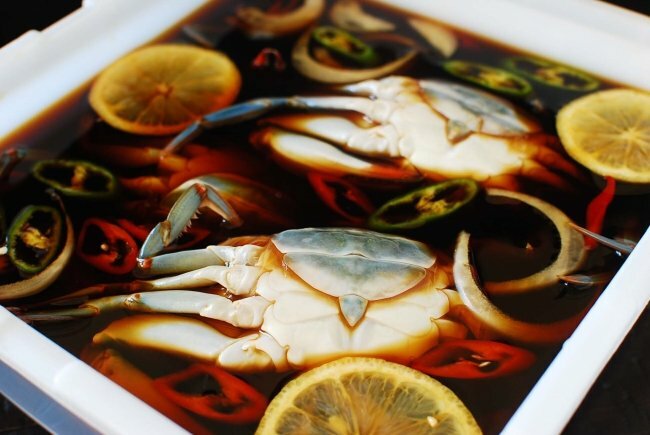 The crab infused brine is also delicious mixed with the rice or as a sauce for other dishes. In Korea, gejang is most commonly made with a crab species called, kkotge (꽃게), aka horse crab. The Korean name literally translates into “flower crab”. Here on the east coast of the U.S., we have blue crabs. I started this gejang post earlier in the summer, when the peak season for Chesapeake Bay blue crabs had just started. But even now, I am still able to find fresh female crabs with roe. We Koreans prefer female crabs for making gejang, but you can also use male crabs, especially in the fall when they are fat and bountiful. As is the case with the consumption of any raw seafood, be sure to use only the freshest crabs. The method for making ganjang gejang is relatively simple. Dealing with the live crabs will be your biggest challenge. However, it’s very common in Korea to freeze live crabs since fresh crabs degrade very quickly. I always put them in the freezer for a while for easier cleaning. To make the brine, Korean cooks tend to use a wide variety of aromatic ingredients. The goal is to eliminate the raw, fishy taste while enhancing the flavor of the crabs at the same time. 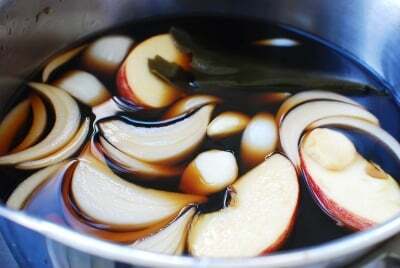 The brine should be flavorful, but not overpowering and too salty. 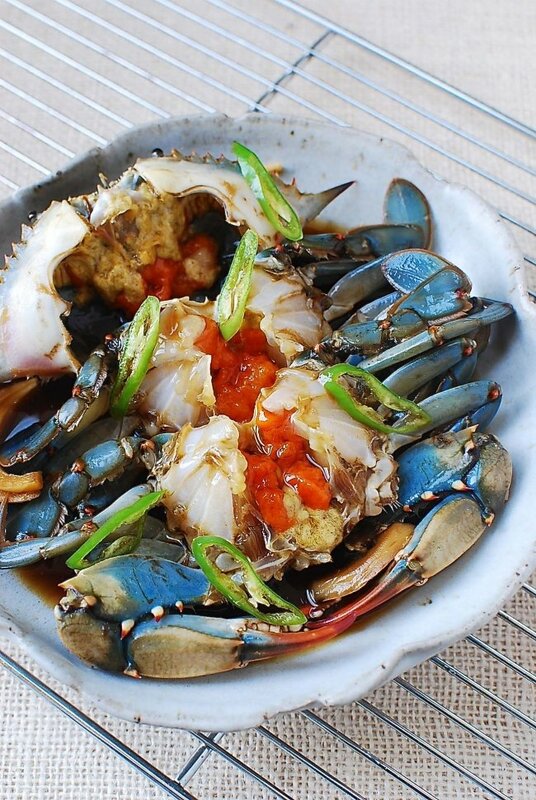 Ganjang gejang is a traditional dish that’s made by marinating fresh raw crabs in a mild soy-sauce based brine. Put the live crabs in the freezer for an hour or two (longer is fine as well), unless you are comfortable with handling live crabs. Meanwhile, bring all the marinade ingredients to a boil over medium high heat. Reduce the heat to medium low, and continue to boil, covered, for about 20 minutes. Remove the kelp after about 10 minutes of boiling. Strain the brine. Discard the fruit and vegetables. Cool completely, and then refrigerate until ready to use. 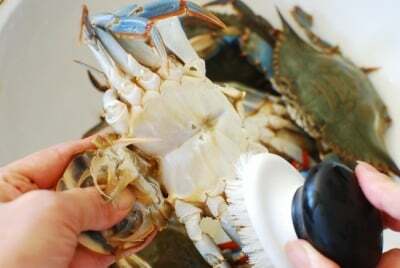 Clean each crab thoroughly with a kitchen brush. Drain well in a colander in the fridge. Place the crabs in an airtight container or jar. Add the chili pepper, onion and lemon slices. Pour the brine over the crabs. Make sure all the crabs are submerged. Weigh them down, if necessary, with a small bowl or plate that fits inside the container. Refrigerate. After one day, strain the brine into a pot (and put the crabs back in the fridge). Bring the brine to a boil over medium heat, and boil for 3 to 4 minutes. Wait for the brine to completely cool, and then pour it back over the crabs. You can skip this process, but it enhances the flavor of the brine and helps the crabs to last longer. The crabs are ready to eat after two to three days of preparation. Separate the top shell and break the body in half before serving. Use a crab or nut cracker to break the claws. If left in the brine for too long, the crabs can get too salty, and the meat will start to dissolve. 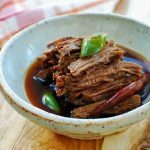 It’s best eaten within 3 to 4 days of preparation. After that, individually freeze any leftover crabs with a little bit of the brine in a freezer bag. Thaw in the fridge for a few hours before serving. The crab infused leftover brine can be re-used to marinate meat or as a dipping or seasoning sauce. Boil it for a few minutes and cool before saving it in the fridge for later use. It is just a little after 5 in the morning here and I am reading this and drooling at the those of these briny soy sauce crabs. Oh the roe! Thank you, Cynthia! So good to see you again. 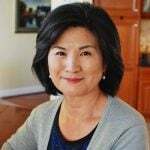 I love your blog and think your pictures are wonderful. In your instructions, you say to clean the crab with a kitchen brush. Do you only clean the outside and leave the crab whole? Hi Miss Meow – Thanks for the nice words! Yes, that’s how it’s typically done. Otherwise, the crab meat can get too salty too soon. Hope you try it out. I tried this in Korea and love it profoundly. Can we use other types of crab, eg. Mud crab instead? I haven’t had mud crabs. But if they are large species, use small ones. Large crabs are not suitable for this dish. Try it and let me know. Thanks. I have to make this I really have to. This would be the dish of all dishes to make. I haven’t had this since my Halmuni was alive. You touched a wonderful memory, thank you. Jimin from Toronto. Hi Jimin – Grandmother’s food is the best! Just ask my children. I’m glad this post helped you bring back fond memories of your Halmuni. Hope you get to make it. Cheers! I’m three pregnant and i’m seriously craving for this dish. Been looking everyday at Instagram for the pictures. Thank you for sharing your recipe. I’m so excited to make this recipe. Kamsahamnida. Hope you get to have it soon! Best wishes!! This is the kind of food that really take me back to childhood. I also remember baby crabs (I guess?) marinated in something and is it possible that we ate the whole thing, shells and all? It’s a little vague, dating back to when I was in pre-school. I don’t know why but I get intimidated about making this type of food and just wish my mom was still around to make it for me! Looks really yummy! 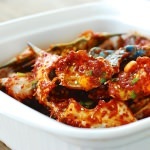 SoyB – I used to like those baby crabs as well, but they are hard to find here in America. You just have to try it once, and it will get easier to make. Thanks for sharing your childhood memories! In NYC? That must have been delicious! Shaun – Hope you get to try it yourself. Thanks for visiting! 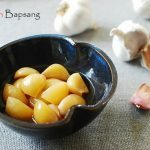 Welcome to Korean Bapsang! I’m happy you found my blog as well. Ha ha you’re right! Your gain their loss… Thanks for visiting. 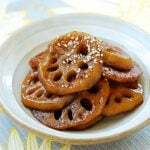 my daughter just came from korea and she brought some ganjang-gejang with her which we all liked. i would like to make some here in the philippines (we have a smiliar dish but use crablets and salt only) but i can’t find live crabs in the wet market. does the crabs need to be alive? You can use properly frozen crabs as well. But, the crabs need to be good quality and fresh because you’re eating raw. Hope this helps. Thanks for coming by! It was a god sent! ? BTW, I assume you remove the gills and other innards after the marinating is done before serving the crabs? ? Thanks! Yes you can remove them or let the person eating do the job while eating. 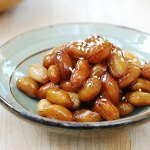 Do you have any specific suggestions for how to reuse the marinade? You can marinate meat with it. It will be delicious! You can also use it as a dipping sauce. Hope this helps. As a korean aussie, I find it hard to keep up with mum or grandma’s instructions haha. So these step by step recipes are a dream, thank you! 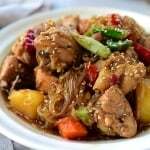 Now that I am pregnant, I find myself craving korean food like no tomorrow- I especially go crazy thinking about gaejung!! Is it safe to eat during pregnancy? I followed your recipe however I forgot to stick it in the fridge so it has been marinating at room temperature. Will it still be ok to eat? Hmmm how long was it out? All depends on your room temperature and how long it was out. It’s okay for a short time at a cool place since it’s in the soy brine. Hope you get to save it. No I didn’t. But, I suggest you do. I love the nasty raw crab meat.